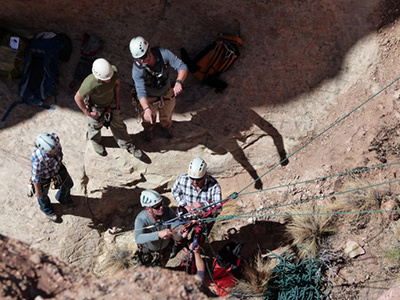 The Adventure Partners’ guides recently practiced technical rescue skills and systems rigging on the Hoodoo Via Ferrata located at Amangiri. The experience was a reminder of the importance training and teamwork play in mastering complex and dynamic challenges. The benefit of training goes far deeper than executing a checklist of critical steps, it fosters a higher degree “situational awareness”, the ability to recognize subtle changes in a stressful environment which can dramatically impact the outcome of decisions and events. The luxury hospitality business in many ways is about anticipation and readiness. Our guests are spontaneous and demand instant response. Improvisation, teamwork and training can make the difference between landing on your feet and falling short of expectations. 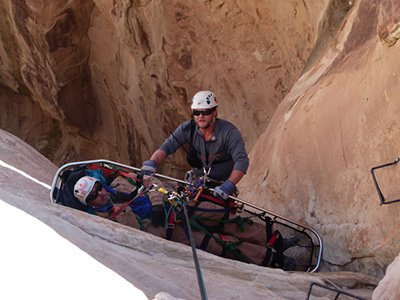 A rescue team is the embodiment of this passion and commitment to readiness and service. 1. A state of completion or preparedness, 2. willing or eager, 3. prompt or rapid response, 4. quick in perceiving; intelligent a ready mind, 5. poised for use or action. A special thanks to Shawn and Shelly King and Kane County Search and Rescue for their expertise and support. We’re excited and ready for a safe and successful season of discovery.